After getting off to a rough start with a pair of losses in the opening week of Northwest Conference play, the George Fox mens soccer team needed to come away with something good from weekend contests versus Willamette and Linfield. The need for a positive result got even higher Sunday versus the Wildcats after the Bruins fell 2-1 at Willamette Saturday; first-year coach Biniam Afenegus' squad followed through with a 1-1 draw at the Austin Sports Complex. George Fox (1-6, 0-3-1 NWC) fell behind the league-leading Bearcats (7-1-1, 4-0) in the seventh minute and things were looking dire after Willamette went up 2-0 just over 30 minutes later, but Freddy Centeno answered with a penalty kick goal 18 seconds later to make it 2-1 in the 38th minute. 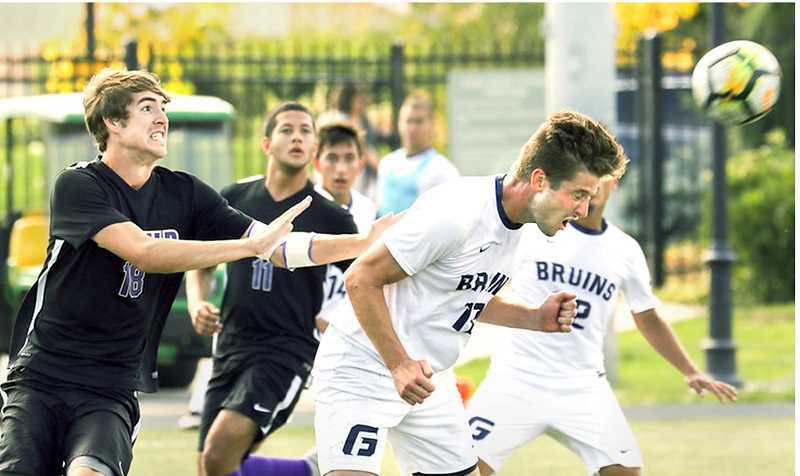 The Bruins got off to a good start Sunday, outshooting their rivals just down Highway 99W 5-2 in the opening half, but settled for a 0-0 draw after 45 minutes. Gabe Ramirez finally broke through to give GFU the lead in the 49th minute, heading home a corner kick by Isaiah Carillo 3:27 in to the second half. It appeared that might be enough to earn all three points, but Mauricio Duran leveled for the Wildcats, scoring on a set piece in the 81st minute. Both teams had to settle for a single point after two scoreless overtime periods. The Bruins will head out on their first full league road trip this weekend, with games at Pacific Lutheran and Puget Sound Saturday and Sunday, respectively. D3 National Preview – The No. 3-ranked Bruins were, fittingly, third after the first round after carding a team score of 308 Monday at Bay Oaks Country Club in Houston, Texas, which will host the NCAA Division III championships in the spring. Rachel Drgastin sat in fifth place individually at 75 and Janelle Decker was sixth at 76 entering Tuesday's final round. Rhodes College led the team standings at 305, followed by Grinnell at 306. Whitworth 3, George Fox 2 – The Bruins gave the first-place Pirates (10-4, 4-0) everything they could handle, but the visitors prevailed 23-25, 25-17, 21-25, 25-17, 15-13 in a five-set thriller. Danyle Dupray slammed 16 kills for George Fox. Whitman 3, George Fox 2 – Dupray collected 18 kills Saturday, but the Bruins (6-6, 0-4) saw their 2-0 lead evaporate as the Blues (6-6, 2-2) won the final three sets 27-25, 25-21, 15-6 Saturday. Pacific Lutheran 2, George Fox 0 – The Lutes scored twice in the first half Sept. 22 and limited the Bruins to just one shot on goal. Willamette 2, George 1 –Savannah Sexton scored for George Fox (3-2-1, 1-2-1) in the 55th minute to level the game, but Gena Main's 80th minute goal lifted the host Bearcats to the win.